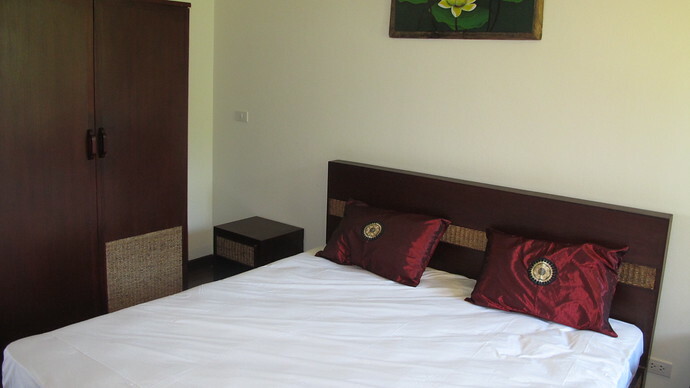 These luxury two bedroom apartments are located in the southern part of Klong Nin Beach ideal for guests who want to find solitude away from the crowds but still close enough that with a short walk you will find many bars and restaurants to indulge. There are four apartments available for rent in total, perfect for big groups of friends and family travelling together. The Apartments B2 and B5 are on the first floor and enjoys truly stunning views of the grounds, beach and setting sunsets. 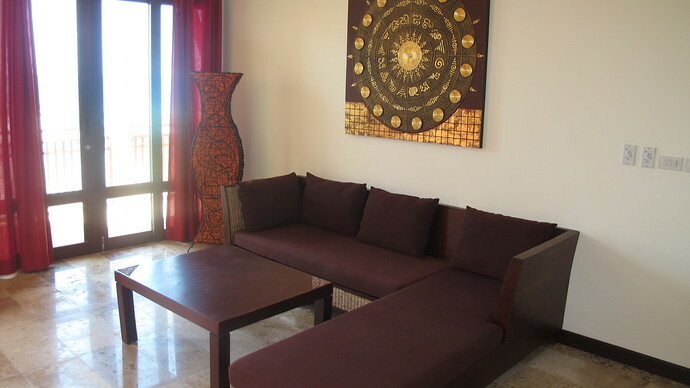 The fully equipped apartment enjoys a spacious open plan lounge, dining and kitchen area. Two double Air Con bedrooms with en suite shower rooms and a private terrace. Apartments A2 and A5 are identical to B2 and B5 but are on the ground floor. On the lower floor outside is a long shared swimming pool and a large sala where you can enjoy your day in a nice cool shady area. In front of the pool is a grassy area and trees where guests can also enjoy the ambiance. 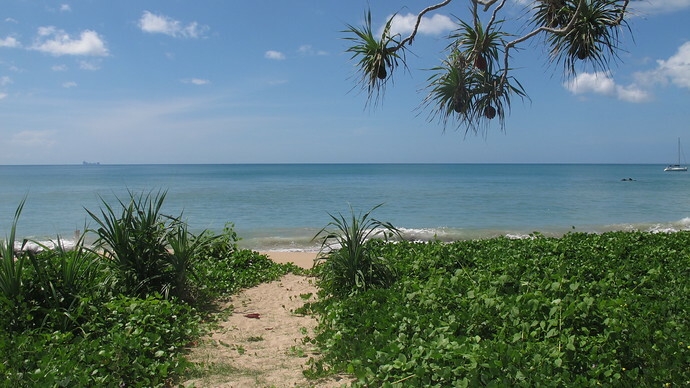 A short walk over the grass lets you enjoy the stunning Khlong Nin Beach and due to the apartments’ location it feels like the beach is a private beach. 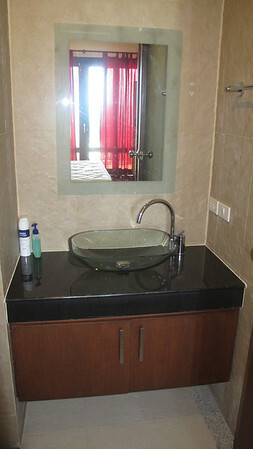 The apartment has a private entrance which is located behind the building. After climbing a few steps you will enter the apartment’s front door which leads into the open plan living area. All the open plan areas have over head ceiling fans to keep cool. The lounge is at the front of the apartment and includes a sofa, TV with a DVD player and nice soft lighting at night. There is also sliding double doors which open up onto a private balcony offering stunning sea views and a clear view of the apartment grounds and swimming pool below. The balcony offers a great retreat to unwind at the end of the day with a cool drink watching the sun set in front of you. At the back of the apartment is the open plan fully fitted kitchen and dining area. 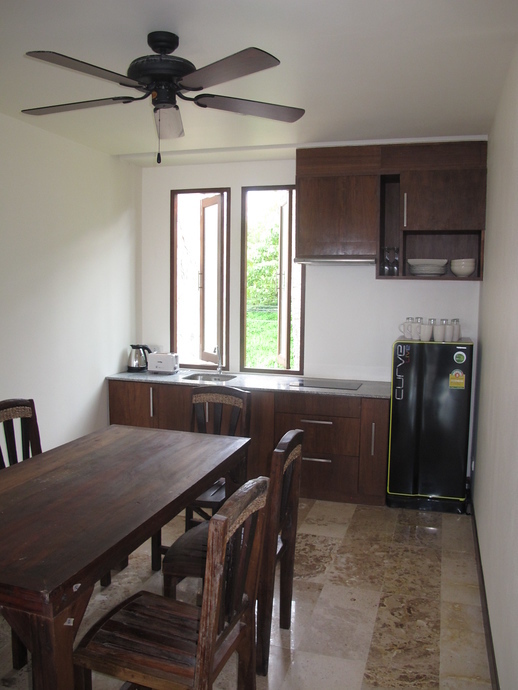 The dining area has a solid wooden table with seating for 6 guests. The Kitchen is equipped with a fridge, kettle, toaster, twin electric cooking hobs, glass and table wear. 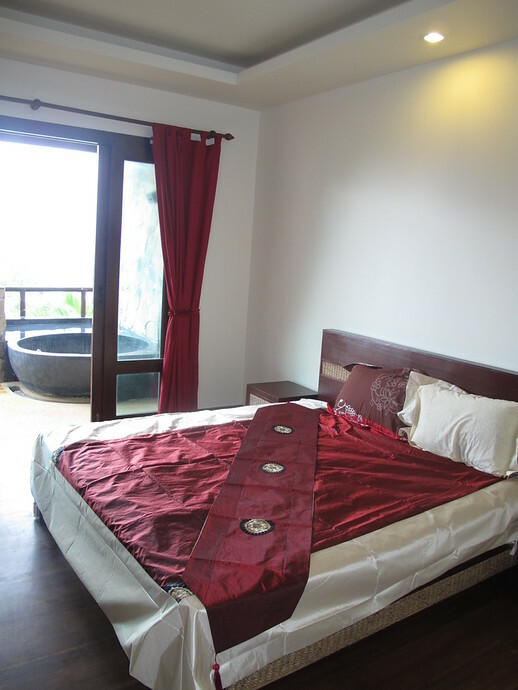 The master bedroom is at at the front of the apartment and is fully air conditioned. The bedroom enjoys a wardrobe and drawers and is en suite. 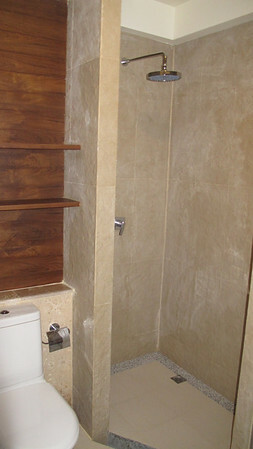 The shower room has a western toilet, glass wash basin and a separate rain shower. 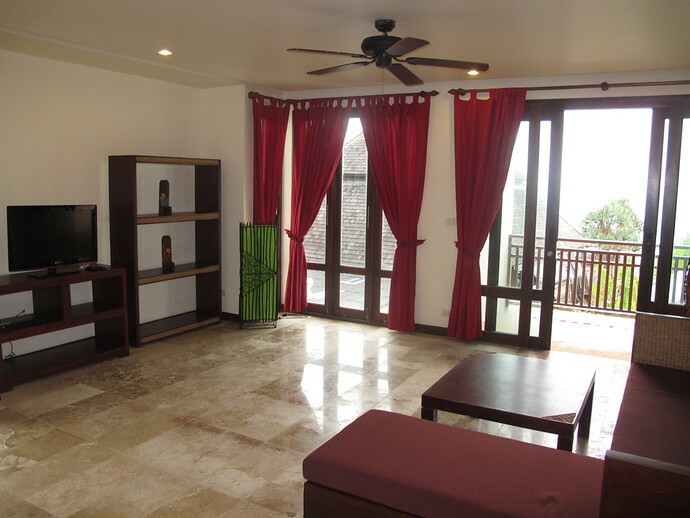 This room also has double glass doors like the living room which open on to the private balcony. The second bedroom at the back also is air conditioned with double bed, wardrobe and drawers. 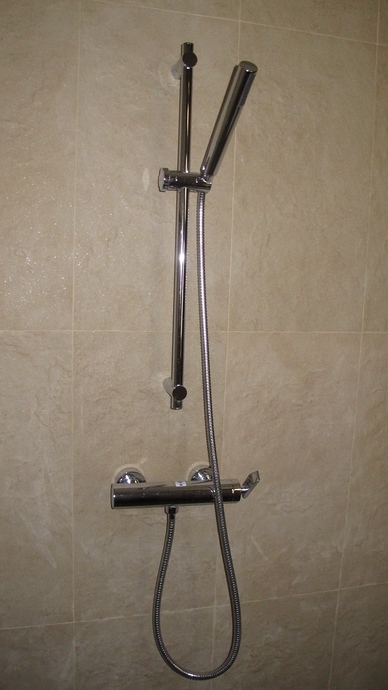 It is also ensuite with the bathroom being the same except the shower is not separated. You can see the exact layout of the beachfront apartment from the architect’s plans. 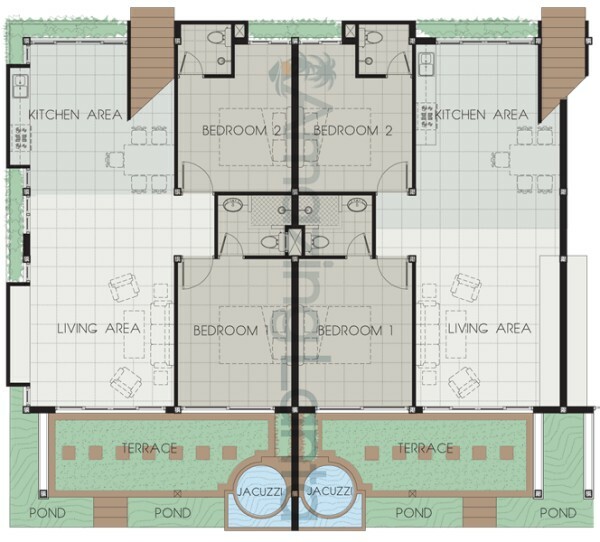 Note that this plan shows two apartments side by side. Although the beach directly in front of the villa is beautiful soft sand it does have large rocks in the water making swimming in the sea difficult. However if you walk 150 meters to the right up the beach there are no rocks and swimming is possible. 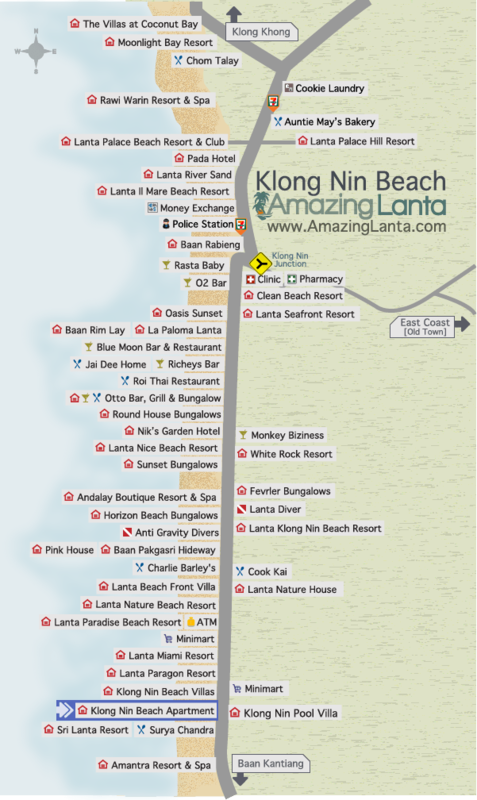 You can see the Klong Nin Beach Apartments location highlighted in blue in our detailed Klong Nin map below, which shows all the major restaurants, bars, hotels and amenities like ATMs and convenience stores in the area. The Klong Nin Beach Apartments are a short walk on flat ground from all these places, making it perfect for families and groups of friends who want to explore the local area without needing a bike or taxi. 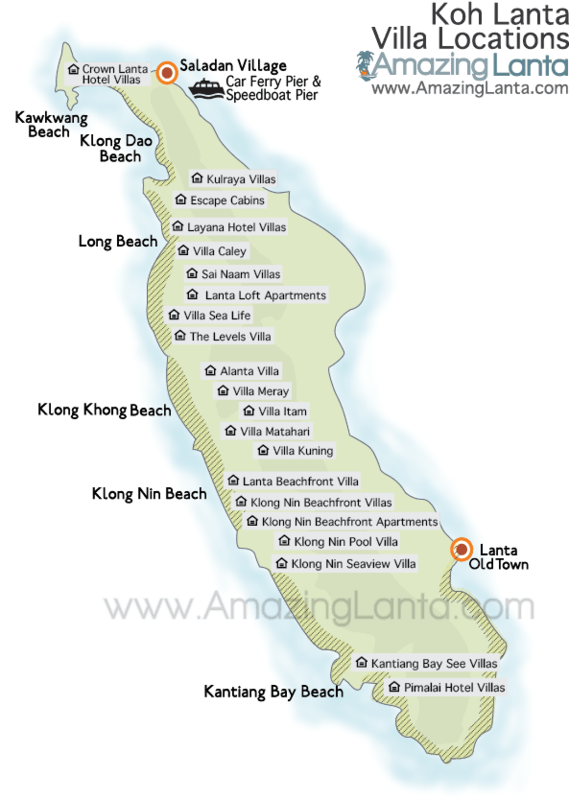 The Klong Nin Beach Apartments are in one of the best holiday locations on Koh Lanta. 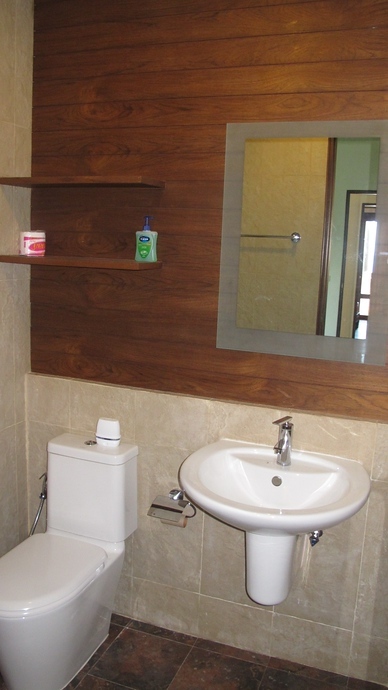 They are situated 20 seconds walk away from the beach, with the apartments’ shared swimming pool directly inbeween the apartments and beach surrounded by lush grass. The apartments are a short 5 minute walk to numerous restaurants, bars and hotel resorts that are all built along Klong Nin beach. you can walk along the beach to access the bars and restaurants or along the road, which is generally quiet. The Khlong Nin Beach Front Apartments are managed by Kamil who will meet you upon arrival, give you the keys and show you around the villa. 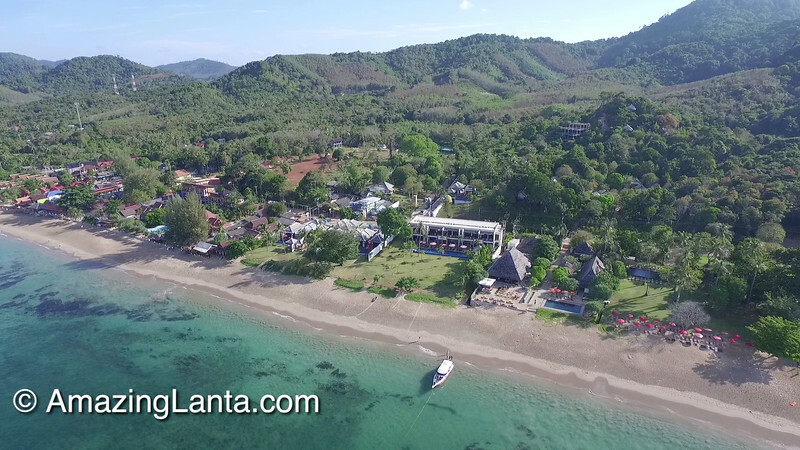 Kamil has an on site office and has lived on Koh Lanta for many years and will be happy to offer his expert first hand knowledge of the Island and also be happy to help and advise you with any problems you encounter whilst you stay. Then on the day of departure Kamil will come to inspect the apartment for any damage and refund your deposit and also to say goodbye. Don’t forget to book an Express Transfer for you return to Krabi Airport or to any other close Thailand destinations. 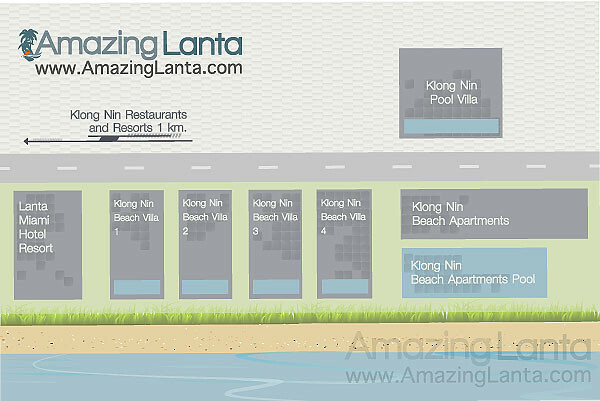 What’s Nearby To Klong Nin Beach Apartments? 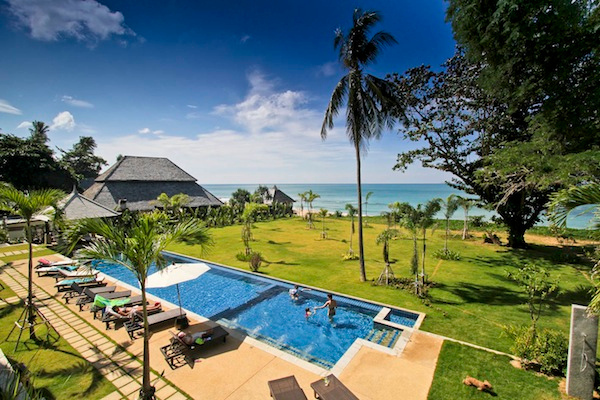 The Klong Nin Beach Front Apartments are located in the quieter southern part of Klong Nin. 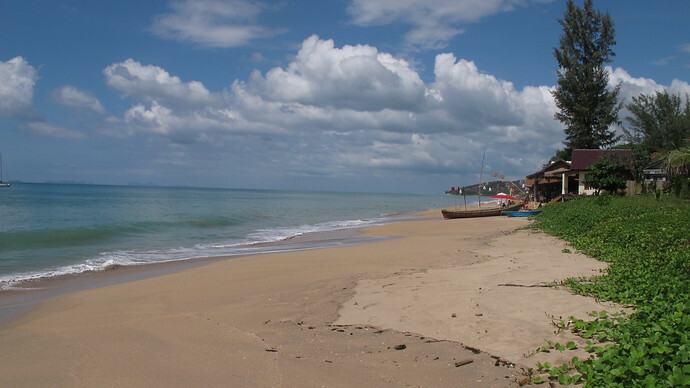 The front faces directly along the Klong Nin Beach and a short walk along the beach you can enjoy many small friendly beach bars and restaurants. The back of the Apartment is next to the road, walk left along the road will allow you access to Khlong Nin’s shopping area, clustered in the Northern part where you will find many ATMs, convenience stores and some quaint jewelry shops. Walking around Klong Nin from the Apartments is very easy as it is all flat paved roads – there are no hills to deal with which makes it ideal for families with strollers. When you come out on to the road turn left and one of the best Klong Nin Restaurants, Cook Kai, is positioned on the right – it’s 200 metres walk. They offer delicious Thai and seafood, if you like it spicy, try the Jungle Curry. Then there is La Monaco Italian Restuarant which sits opposite near the beach. Walk a little further and enjoy Pizzas at Nicks Garden and steaks at Otto’s Bar and Grill. The Roi Thai Restaurant which also offers restaurants in Chang Mai and Bangkok offers some treats cooked with no Msg, they also offer a Thai Cooking School which is open all year. 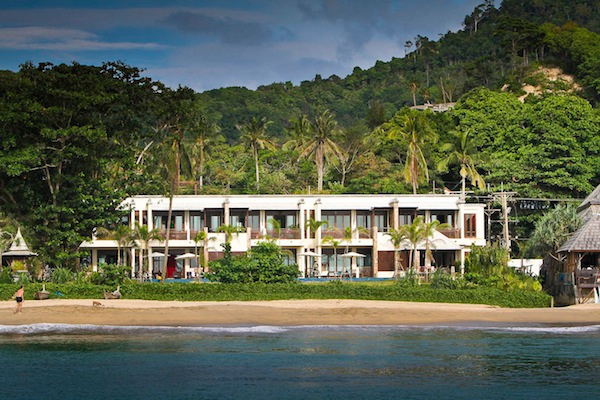 Just in the North the Oasis Sunset Restaurant, newly built mixing new and old Thai styles with a comfortable large decking area looking out to the sea offering Thai and Seafood. For drinks the best is to walk along the beach again turning right. The first place is Mongs Bar – Mong is one of the nicest people on Lanta who really will take care of you. Next to Mongs is the Miami Resort which also has a nice bar. Further along the beach enjoy Blue Moon Bar where you may find you become a regular, then there is the 02 Beach Bar located in the Clean Beach Resort and Rasta Baby, a chilled out reggae house. Please see our Klong Nin Beach page for more information about the area and please see below for a full list of amenities near to the villa. If you are not comfortable with a bike or car then you can easily travel back and forth on the Island by using the local Tuk Tuk drivers. These can be a lot of fun and the locals with there friendly manner will entertain you as they go. How ever even after negotiating a good price this option does start to become expensive as each ride is charged per person. To find a taxi driver just wait next to the road and they will stop instantly. When you are in Saladan the main Koh Lanta Shopping area, if you walk out of the centre there are many queuing up to take you home. How ever later at night this service can become sparse and getting home from a party can become a challenge. Upon on booking a villa we will also provide you with local contact Tuk Tuk driver numbers who we trust will take you home safely any time of the night.